If you're an independent musician, chances are you've asked this question somewhere... at some point. Well, the good news is, now it's not going to cost you "an arm and a leg" to get your music into the stores it really needs to be in. 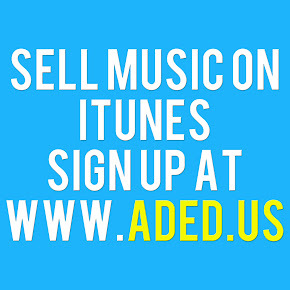 Thanks to ADED.US Music Distribution, independent artists (often referred to as indies or indy's) have an equal footing with major label artists in terms of placement. What ADED.US is proposing is simple: You give them $5 a month to be a member of their distribution site and they'll only charge you $3 every time you want to submit a new project to iTunes, Amazon, Spotify, and a slew of other digital retail stores that offer music. The idea of offering digital distribution deals to independent artists is not a new one. Companies like CD Baby and TuneCore have been doing it since shortly after the iTunes Store opened up. But what ADED.US offers is a chance to personalize and customize the experience, all at a cheaper price tag too... at least compared to the majority of their competitors.